An image from the Spitzer Space Telescope of a possible "bone" from the galactic skeleton. SEATTLE — Scientists are finding more evidence of a galactic "skeleton" lurking inside the appendages of the Milky Way, and studying these massive "bones" could help researchers get a better idea of what our galaxy looks like from the outside. In 2013, researchers first suggested that long, thin, dense clouds of gas may form inside the spiral arms of the Milky Way, creating a sort of galactic skeleton that traces the shape of these massive structures. At the time, only one such "bone" — known as Nessie — had been identified. Now, new research presented at the 225th meeting of the American Astronomical Society shows that Nessie is not alone. Catherine Zucker, an undergraduate physics student at the University of Virginia, has dug up six strong candidates for additional galactic bones. Caption: An artist's rendition of the Milky Way galaxy shows the major arms that have been identified by scientists, though they're not able to observe the galaxy face-on. The sun and the Earth are elevated just slightly above the galactic plane, giving scientists a small boost when they're trying to look at the larger galactic structure (like a kid on an adult's shoulders, trying to see over a crowd). Scientists have identified the large spiral arms that make up the galaxy, but there is still debate about the exact location of those arms, as well as the location of smaller spirals that branch off of the larger ones. But the "bones" that scientists have now identified — long, thin, highly dense clouds of gas that can also be identified by the light they absorb — would be significantly easier to spot, and could help scientists create a more precise sketch of what the Milky Way looks like from the outside. 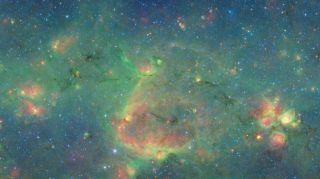 "It's a really new field of study," Zucker told Space.com at the AAS meeting in Seattle, where she presented a poster featuring her work on the galactic skeleton. When Zucker started her work, the gas cloud known as "Nessie" was the only object of its kind that had been identified, and the only candidate for a bone. "What I was trying to do was basically prove that the Nessie filament wasn't some curiosity, wasn't a fluke — that there are other filaments out there similar to Nessie that can trace galactic structure." Zucker started looking through images of the galaxy taken by various telescopes, including the Spitzer Space Telescope. She found 15 long, thin gas clouds that looked like they could be galactic bones. There were six initial criteria for a galactic bone. For example, it must lie mostly parallel to the plane of the galaxy and be associated with a known spiral arm — Nessie appears to trace the spine of the Scutum-Centaurus Arm, one of the largest arms in the Milky Way. A bone must also be more than 50 times longer than it is wide — Nessie is more than 300 times longer. Zucker also had to make sure she was seeing a single cloud and not multiple clouds in the same line of sight. Zucker is focusing on something called "Filament 5," which could be a bone that lies in the Scutum-Centaurus Arm, just like Nessie, but on the opposite side of the galaxy. There is still some debate about the exact location of the Scutum-Centaurus arm. Different measurements put it within a few degrees of the center of the galactic plane. Zucker said bones like Nessie could "potentially resolve a lot of those issues." Ultimately, these bones could serve as a guide for creating a sketch of the Milky Way' major structural elements, and give scientists an outside view of our galaxy, without requiring them to leave home.